The Program Penajaan 9A+ [P9A+] 2019 is an automatic sponsorship to outstanding students with Sijil Pelajaran Malaysia (SPM ) in 2018 who scored A+ in all subjects taken in the SPM 2018 with a minimum of nine (9) of the subjects were taken for further studies at universities in the country. Candidates will be offered sponsorships in the form of a Convertible Loan (PBU) to pursue preparatory courses until they obtain their First Degree. (iii) Age does not reach 18 (19 year for transition students) on December 31 in the year SPM was taken. PLEASE CLICK HERE FOR MORE INFO AND APPLICATION..
CLOSE DATE : 30 JUN 2019 | APPLY NOW!! 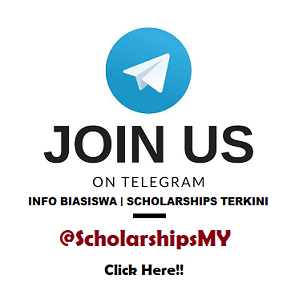 FOR LATEST SCHOLARSHIPS INFO DIRECT TO YOUR PHONE - PLEASE JOIN OUR TELEGRAM => CLICK BELOW..